Finally! Something that we are going to see. After the last few weeks of digging ditches and drains and a whole lot of work that only gets buried – we began to lay the brick for the barn pergola patio. 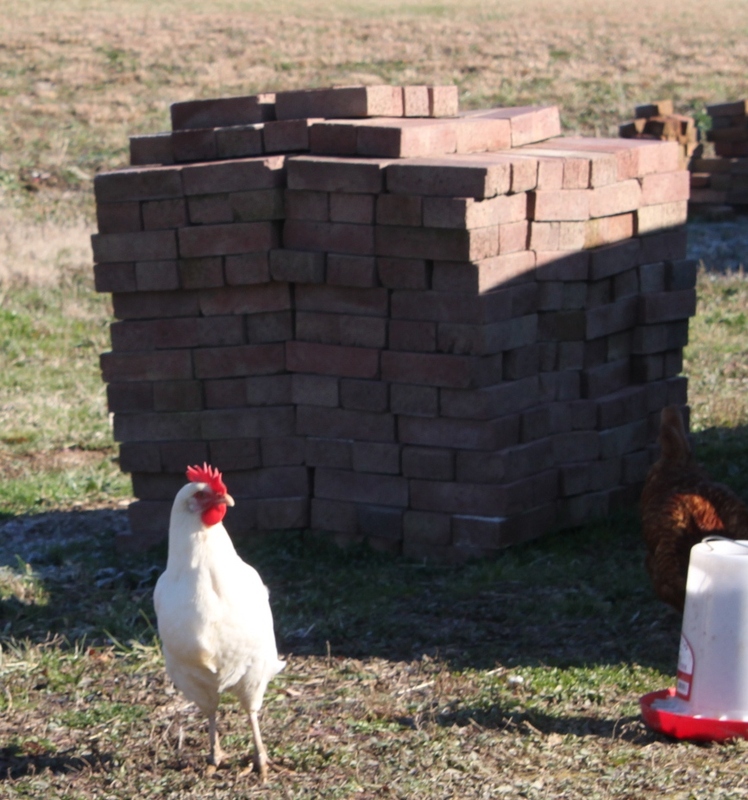 Piles of reclaimed brick are a pretty common site around the farm – it will be nice to finally see them put to use. All of the brick for the project is reclaimed from sites all over Ohio. A large portion came from the brick floor to my dad’s old barn and the Cardington, Ohio barn we tore down late last summer. Still more from old brick patios in Columbus and Zanesville, Ohio. The end result is a large stash of brick that we hope to blend into a really unique pergola patio floor. 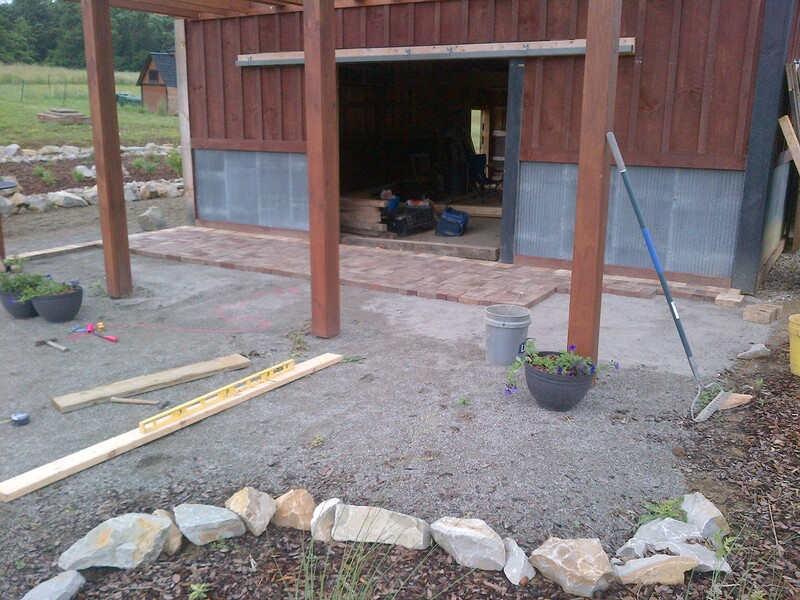 When we first built the barn late last year – we had put down a good 3 to 5 inch base of limestone screenings. It’s basically the limestone dust that is left over when quarries separate the various sizes of rocks through screens. It’s a really inexpensive product (about $5.00 / ton ) – and is great to use for a base material of patios and walkways. It fills and levels easily, and once it’s down and gets wet – it locks down and turns into a concrete-like base. That really helped give us a head start on the patio. We simply added a few more inches of the screenings to level it and then tamped it down to give us a perfect working surface. 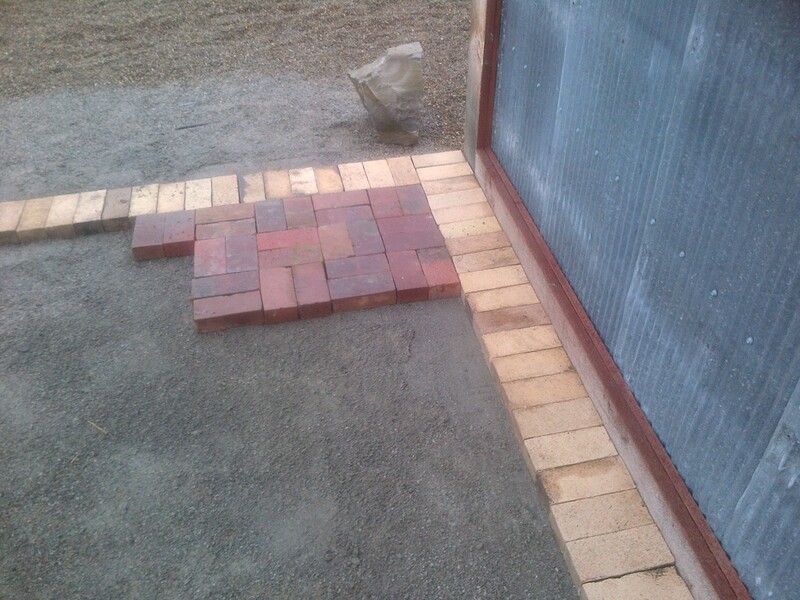 So with a little string – a level – and a whole lot of reclaimed bricks – we began to build it. One thing is for sure, when your working with reclaimed brick from all over – nothing will ever fit “perfectly”. We had to experiment for a while with the pattern to decide on the look we wanted. We finally decided to use a soldier course around the perimeter using dad’s old brick – and then fill in the main patio area with the red fired brick. 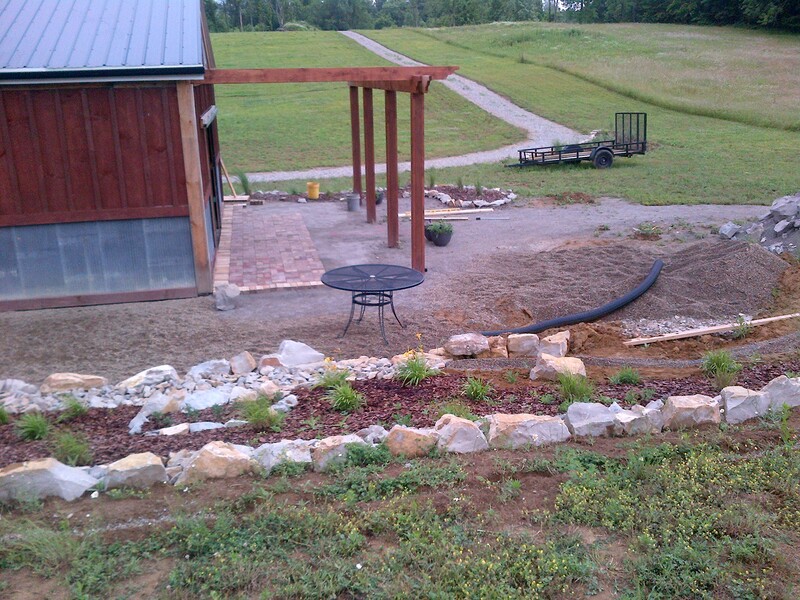 We worked last evening for about 3 hours -and made pretty good progress -about 1/3 of the main patio area is down. Hopefully, by the end of the weekend -we can fill in between with mason sand – set down a couple of tables and chairs…and relax! Oh wait – that’s right – we still have to brick the whole barn! Oh well, all in time….. Looking down from the garden at the progress on the patio. ← OUR BIG “THANK YOU” GIVE AWAY CONTEST!